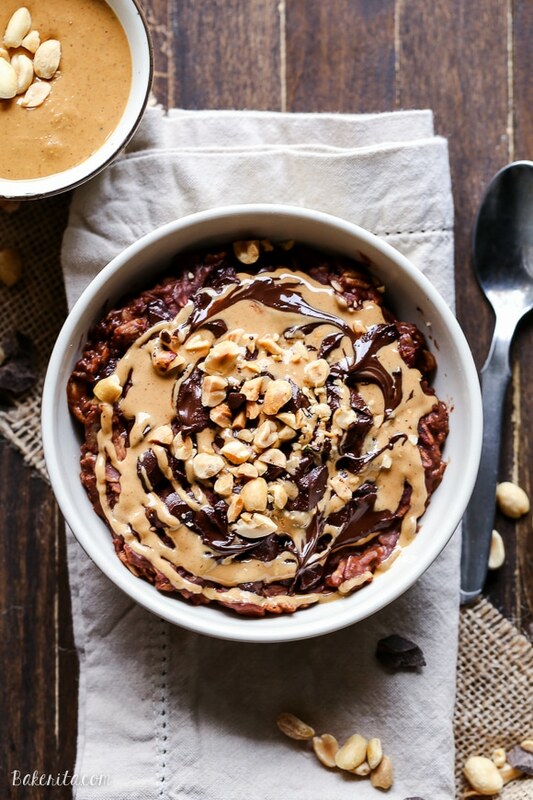 This Chocolate Peanut Butter Oatmeal tastes like a peanut butter cup, but it’s sweetened with just a ripe banana! You’ll love to wake up to this gluten-free, refined sugar-free + vegan breakfast. The photos in this post were updated in May 2016, but the recipe and writing below remains the same as when originally published! I’ve been rephotographing some of my old favorite recipes here on the site that don’t get nearly enough attention, probably because the photos didn’t do this delicious oatmeal justice. It’s clear to everyone who knows me I’m addicted to chocolate and peanut butter together. They’re perfect for each other, and anyone who has ever eaten a peanut butter cup can attest to that. 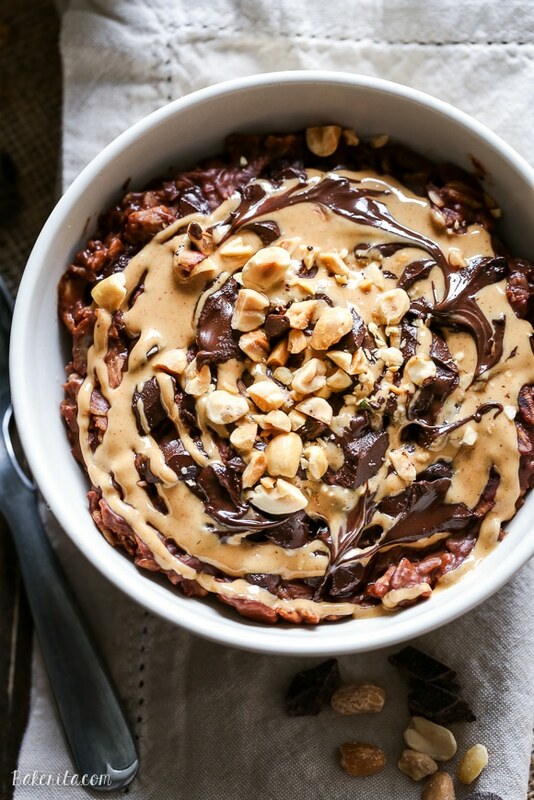 I tend to put the two together extremely often, and only a handful of my chocolate and peanut butter recipes have even made it onto the site. I’ve made tons of recipes combining these ingredients, and there are plenty more chocolate and peanut butter recipes that lurk bookmarked in my cookbooks, pinned onto my Pinterest board, and jotted down in my recipe brainstorming notebook. However, recently my main issue with chocolate and peanut butter has been that it’s not exactly the healthiest combo on the block. Yeah, peanut butter has healthy fats, but it’s still super high in calories and should be eaten in limited amounts. My peanut butter recipes don’t tend to limit it at all – in fact, I usually put in more peanut butter than recipes call for. Oops. Chocolate, well, we can pretend until we’re blue in the face that chocolate is healthy, but we all know the truth. Chocolate has a few benefits when you have one piece, but when you’re eating like, 10 ounces? Yeah, those benefits are long gone. So I wanted to make these ingredients sing in deliciousness, and healthfulness! Oatmeal has been one of my go-to breakfasts recently, and I always make it sweetened with only a mashed, ripe banana and made with almond milk. It’s so creamy, perfectly sweet, absolutely delicious, and good for me. So one day while I was grabbing the almond butter I usually swirl on top, I spotted the cocoa powder and decided to toss in a spoonful. Perfect. My other hand reached for the peanut butter, and I knew it was going good places. A scoop of cocoa into the oats turned them perfectly chocolatey for less than 10 calories and I added swirl of peanut butter on top for good measure. For kicks and giggles, I threw on unsalted raw peanuts for some crunch and a few refined sugar free chocolate chips. It tasted sinful, delicious, and absolutely not like a healthy breakfast – AKA my new favorite breakfast! Since I first made it, I’ve made it at least four times a week for breakfast. It’s that good! I hope you enjoy as much as I do. In a small saucepan, combine oats, banana, almond milk and cocoa powder. Simmer until milk has absorbed into the oats, stirring frequently to prevent burning, for about 4-6 minutes. To keep the recipe refined sugar free + vegan, make your own chocolate chunks. I’m making this. You are a genius. Haha! Let me know how you like it :) I’m sure you’ll love it if you’re as much of a chocolate-PB-aholic as I am! Where do you get your sugar-free choc. chips? can this be made without the bananas? You definitely could, you’d just have to add a different sweetener. I’ve done it with white sugar, brown sugar, and Truvia, all added in with the cocoa powder. Still tastes delicious, just without the nutrition of the banana. I typically do about a tablespoon, but adjust to your tastes! This is my standard go-to for oatmeal! One of the best (and kind of healthy/indulgent) breakfasts! I work nights in a hospital and usually go for yogurt or oatmeal around 3 AM. This sounds great, but I only have a microwave. How can I make it work. This is about 4 years late, but I make a triple batch at night and refrigerate it. Then I reheat my portion in the microwave for one minute. I do put the peanut butter in when I make it, but add another swirl after reheating and sprinkle with chocolate shavings. Love this recipe! Ps: When you write your cookbook, please include this one! Oh my goodness… YUM! This is definitely a recipe I would make over and over and OVER, too. 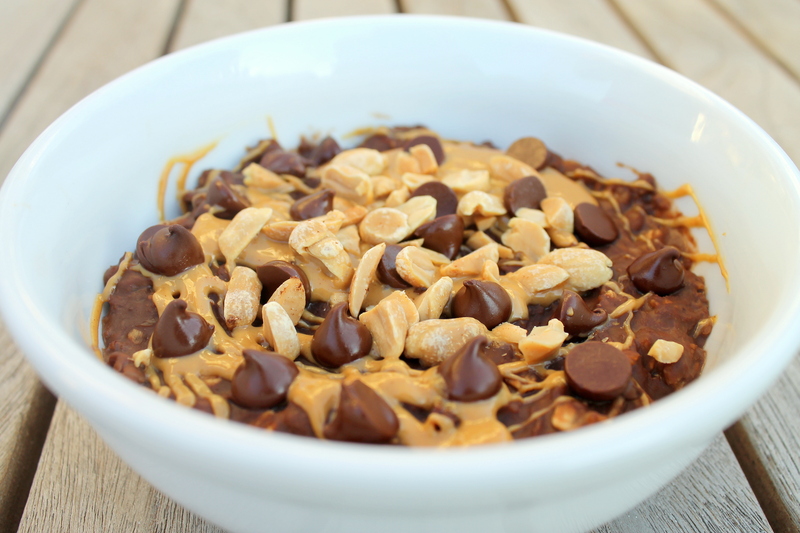 :) I don’t see how you could go wrong with a giant bowl of PB cup for breakfast! You definitely can’t ;) thanks Jess! 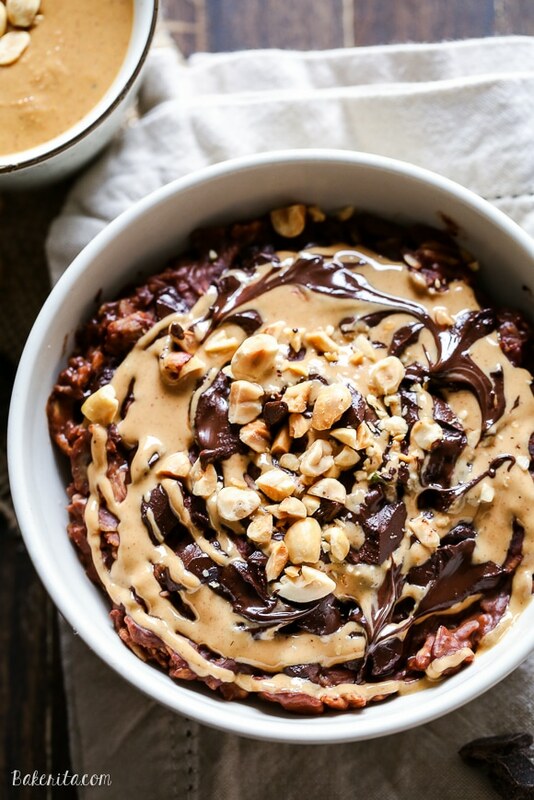 Gah peanut butter and chocolate oatmeal??? Yes to the yes! Sounds amazing! I love this combination of oats! I plan to cook this with sugar free chocolate chips, since I am watching my sugar intake. I’m thinking this recipe is going to get a LOT more attention with photos like this, Rachel! I don’t know what the old ones looked like, but I just want to dive into this bowl! 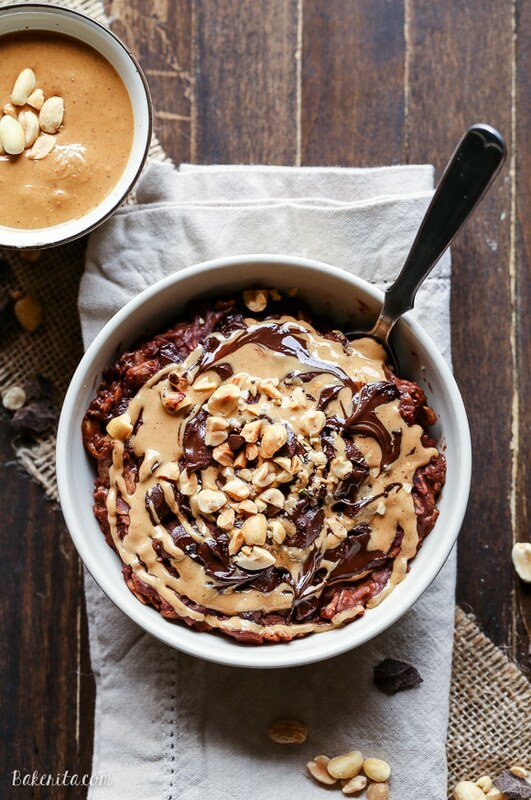 I seriously need this for breakfast this week — oats never looked better! So I have to be in the mood for oatmeal and can’t eat it all the time, but I know I could devour this just about every day. I love the chocolate and peanut butter combo, Rachel! Swooning over that gorgeousness! 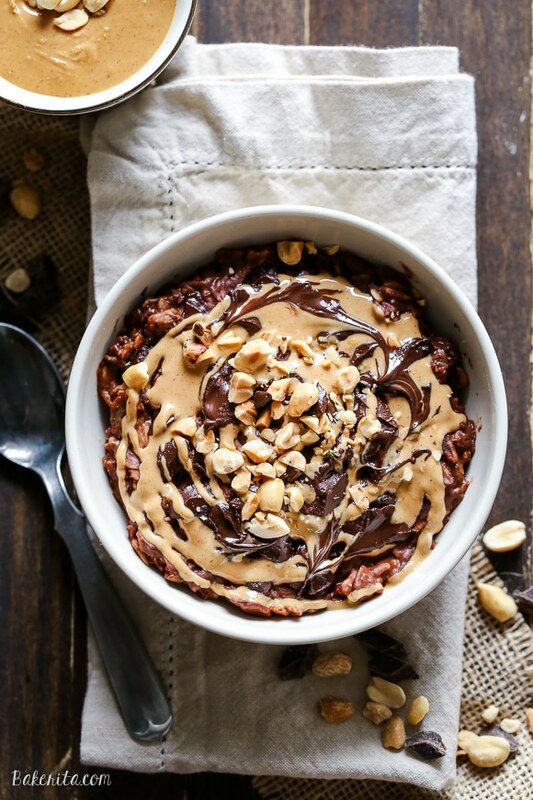 Peanut butter and chocolate oatmeal?? OMG, I don’t think breakfast can get any better Rachel! The prettiest bowl of oatmeal I think I’ve ever seen! These new photos are GORGEOUS. Like very much award-winning quality. So I think your mission has been accomplished. And the recipe is pretty awesome, too! Aw, thanks so much Mir! I would not mind a huge bowl of this oatmeal for breakfast every day of the week. LOVE this!! Any excuse to eat chocolate or sweets for breakfast, I’m IN! Pinned and sharing! Now this is my kind of oatmeal! No blandness, just ooey gooey deliciousness. Can’t wait to try this! chocolate and peanut butter is the best combo ever! And having it in oatmeal so I can eat it for breakfast?! gimme! The cocoa makes all the difference! ;) Thanks, Danielle! Holy peanutbutter Batman! That looks so sinful but it’s totally guilt-free which is a win on every level. Love your photos too! THIS is my kind of breakfast. Absolutely and in every way! Hi, this looks amazing, but how do you get your peanut butter to ‘swirl’ do you hear it up beforehand? Hi Vicky, for these photos I did heat it up before hand to get it to swirl like that :) I usually make little dollops right on the hot oatmeal and wait a sec for it to melt and then swirl – not as pretty, but just as delicious! Chocolate + peanut butter is the bomb. com (people still say that, right?). I tend to add more peanut butter than called for too. This was a decent breakfast. I made a few substitutions based on what I had in my pantry (cashew milk, cacao powder, almond butter and walnuts) and it was really good. Maybe it’s just me, but when this cooled off quite a bit (I got distracted), it reminded me of those no-bake chocolate oatmeal cookies, just a bit less sweet. Thanks for sharing! Ooooh I can certainly see the comparison there! So tasty. So glad you enjoyed the oatmeal, Angelique! For two people who hate oatmeal, this was great- thank you!